In a world where streaming services are becoming the norm and different companies are licensing their properties to different services, it can be hard to figure out which streaming service to subscribe to in order to see the shows that you want to watch. Enter TubiTV – a free streaming service that features some of your favorite properties and you may not have ever known about it! We are pleased to share with you that TubiTV currently has eight seasons of Shout! Factory/Shout! Factory TV’s Super Sentai subtitled series available to stream for free. TubiTV is a 100% free, legal streaming service. You will experience occasional ad breaks during your streaming. Shout! Factory and Shout! Factory TV are licensed partners with TubiTV. We did reach out to Shout! Factory and Shout! Factory TV before running this story for clarification on their license agreement with TubiTV. They confirmed that these streams are legit – and to enjoy! Click here to begin streaming Shout! Factory and Shout! 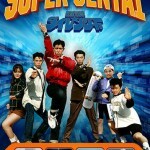 Factory TV’s Super Sentai series on their TubiTV channel for free! This post is not a paid endorsement or advertisement for Shout! Factory, Shout! Factory TV, or TubiTV. This post is simply an informational post aimed directly at the numerous fans that contact us weekly asking for ways to watch popular shows online for free. Each user experience on TubiTV may differ and TokuNation.com is only telling you the service exists. With release impending in August, Bandai B-Boys have updated their blog with new unpainted prototype images of the upcoming Super Sentai Artisan Won Tiger! The blog post mentions that they are in the middle of mold progression and finalizing changes to it before final release. Adjustments will continue to be made. Mention is also made of the new double joint in the Tiger’s forward legs, allowing it to pose in ways the original couldn’t. They also talk about trying to find the correct balance in the marbling of the white/gray parts. Another blog update for this gorgeous piece is scheduled for June 1st. We’ll see you again then! 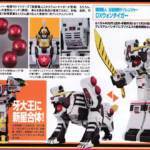 Following the release of Super Sentai Artisan DX Rairen’Oh last year Bandai teased us with the prospect of an Artisan Won Tiger release, and that piece has fully been revealed in the latest issue of Figure Oh magazine. Of course, Super Sentai Artisan DX Won Tiger is fully capable of combining with the aforementioned Dairen’Oh. Also included are seven Treasure Perals which can be swapped out. All of this will cost 14,400 yen as a P-Bandai release. Premium Bandai has teased their next exciting Super Sentai Artisan release! 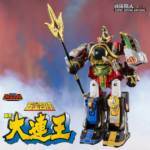 Following up from pre-sold out DairenOh is it’s companion, the Super Sentai Artisan Won Tiger! Though for now we only has a very small teaser image, this official confirmation means that in the near future we should be getting some proper release details and images. As with DairenOh we are likely to see a Won Tiger with several physical improvements, new premium paint apps to replace vintage labels, and some diecast parts as well. We’ll update you as soon as more information becomes available for the Super Sentai Artisan Won Tiger release! Super Sentai Artisan Dairen’Oh Pre Order Details! A few months ago, Bandai teased the release of the Super Sentai Artisan Dairen’Oh a pre order page has now gone live and with that, we have a plethora of new photos along with release details. Rather than being a remold of the Legacy Thunder Megazord as previously speculated by some, the Super Sentai Artisan Dairen’oh is, in fact, a modified version of the original DX toy with some added paint apps and die cast parts. All of this will cost a hefty amount retailing about 23,760 yen but won’t see a release till March 2018. The Lai-Lai Jewels while shown appears to be part of some sort of campaign give away and not included with the actual set. Sad news today coming from the brother of Tatsuya Nomi, the actor who portrayed Daigo the Shishiranger in Gosei Sentai Dairanger. According to his brother, Tatsuya Nomi passed away on May 18th, 2017. He was 47 years old. Our thoughts, prayers, and condolences are with the family and friends of Tatsuya Nomi. May he forever Rest in Peace. UPDATE – sadly it would appear Tatsuya Nomi died as a result of suicide. Shout! Factory TV’s Dairanger Marathon – Happening NOW! If you’re reading this then you’re missing out on the marathon from Shout! Factory TV – a marathon of Gosei Sentai Dairanger (currently available for purchase on a variety of media websites). This Super Sentai series is where the beloved Mighty Morphin White Ranger originated from, as well as the Thunder Megazord and Tigerzord! 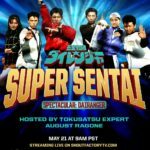 The Dairanger marathon starts at 9am PST at ShoutFactoryTV.com! The marathon is hosted by tokusatsu expert August Ragone! Last time there was a marathon (Zyuranger), we got the announcement of Ninja Sentai Kakuranger being subtitled. Does that mean we’ll get Ohranger (Zeo) announced this marathon? Only one way to find out – stay tuned to the marathon! Shout! Factory has posted official details for the upcoming Gosei Sentai Dairanger DVD boxset! The three Tribes of the Daos Empire — Shura, Dai and Gorma — were peaceful until the Gorma set out to conquer the planet, launching a magical war between the Gorma and Dai Tribes that lasted for 5,000 years. In the end, both civilizations were lost… until now. The evil Gorma have returned. Now, it’s up to Master Kaku to assemble a team of kids with high levels of chi to become the protectors of the Earth known as the Dairangers! The 10-disc collection has a price of $53.97 and an estimated release date of November 10, 2015! In a similar fashion to last years Kyoryu Sentai Zyuranger news, the fine people at Shout! Factory have just dropped another bombshell on the tokusatsu fandom. When asked by a fan in the audience at tonight’s San Diego Comic Con 2015 panel, “Will we get a new tokusatsu title?” they were able to reply yes. And that title is Gosei Sentai Dairanger! 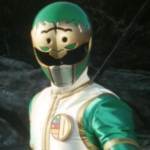 Fans in the west will undoubtedly recognize the footage from this show as it was utilized for Mighty Morphin Power Rangers Season 2 as well as the character Kiba Ranger who was adapted as the Mighty Morphin White Ranger. Still yet people may recall the “new powers” of Power Rangers Super Megaforce where the Dairanger suits were shown on American TV for the first time. For now it’s safe to assume that this DVD set will follow the same formula as Shouts Zyuranger DVDs at a similar price point for the entire series in one set. 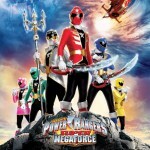 New Power Rangers Super Megaforce Promo Highlights DAIRANGER Powers?! The latest promo for Power Rangers Super Megaforce Episode 2 “Earth Fights Back” has a very surprising new element! 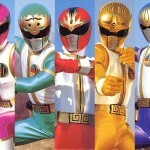 As explained by Gosei, the Legendary Powers can also unlock Ranger Forms that were never seen on Earth- specifically, the “DaiRanger” costumes that were passed over during “Mighty Morphin Power Rangers” Season 2 and have never been used by Saban before now! What other surprises might Super Megaforce have in store?? Tune in February 23 and find out! !